Cost: $350 for the month, $100 a week. Enrollment is open to all children ages 5-13. Thank you for a great summer!!! 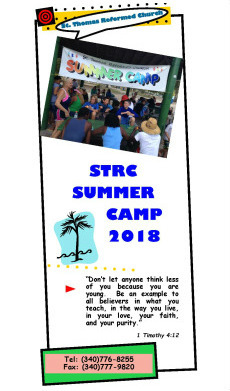 Registration and health forms must be completed before the first day of camp. Forms are available HERE on our website or can be picked up at the St. Thomas Reformed Church Parish Hall @ the corner of Nye and Crystal Gades. Many thanks to our camp staff and volunteers who make our summer camp the best!!! !